It might seem absurd, until the 2012 discovery by students at Yale University, who found that a rare species of mushroom from the Amazon rainforest is capable of subsisting on plastic alone. More precisely, Pestalotiopsis microspora consumes polyurethane, the key ingredient in plastic products, and converts it to organic matter. Further, Pestalotiopsis microspora can live without oxygen, which suggests enormous potential for feeding on, and thus cleaning up, landfills. So once again, nature holds the answer. This approach to dealing with plastic overload emerges just as the EU has voted to ban all single-use plastics by 2021. However, that legislation may have more to do with industry politics than with cleaning up the planet. It does nothing to address, for example, the garbage patch twice the size of Texas that’s currently floating in the Pacific Ocean. And if that’s too big a feat for these mushrooms to take on, scientists are still optimistic that this discovery will at least change the way we view and use plastic. For example, they envision at-home recycling kits and community recycling centers with fungi systems built in to utilize this process. But for those who wonder if feeding on all this plastic this might be creating another monster – overgrown mushrooms instead of trash piles — nature proves to be a problem-solver once again: some plastic-eating species can be eaten themselves. 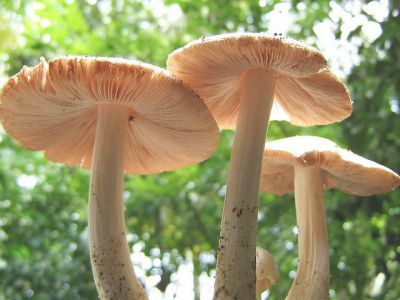 That’s right — in a fascinating study led by Katharina Unger of Utrecht University, it turns out there are actually several species of mushrooms that will eat plastic, and some of them are common, such as the oyster mushroom, which is also edible. However, even though there is no plastic left in the finished product, and according to Unger, they taste “sweet with the smell of anise or licorice,” convincing the general public to eat these mushrooms might be a hard sell. More studies are needed to determine the safety of doing so. If found to be safe, then this process holds potential to solve another problem – world hunger. With a reported 100 million people around the world who go hungry every night, having a food source that grows by converting trash to treasure may be worth more than its weight in gold. The list of benefits continues in a report from scientists at the Kew Gardens in London. Their first ever State of the World’s Fungi 2018 confirms that not only can mushrooms help break down plastic, their finished products can be used to create furniture and building materials (“mushroom bricks”). Additional benefits include mushrooms’ abilities to remove pollutants from soil and to enable the conversion of waste into biofuels. These amazing abilities of mushrooms have given scientists as well as leaders in architecture and design a way to view to the future with a hopeful eye. All in all, the discovery holds exciting promise: in controlled conditions, it takes just a few weeks for the mycelium to start breaking down plastic, and in a few months’ time, the plastic is completely broken down, and all that’s left is a white puffy mushroom. Even if not eaten or used for anything else, the mushroom could be composted and turned in to soil at a much faster rate than that of plastic, which is estimated to take 400 years to decompose on its own. Since mycelium are natural decomposers, for instance helping to break down dead trees and return them to the soil, it’s a logical next step to turn them toward breaking down plastic, even though plastic is not an organic material. Mushrooms prove themselves to be capable of magic once again.